Simple Transfer: Transfer Photos and Videos Between iPad and Computer! A BIG obstacle and headache that often occurs when working with iOS devices is being able to easily transfer your photos and videos between the iPad and computer. Emailing is not always the answer. File sizes can become too large. Having to attach image after image is a hassle. An even bigger hassle is having to plug the device into the computer. Simple Transfer is a free app that will allow you to transfer your data wirelessly to or from any computer. Simple Transfer is VERY easy to use. Once it is downloaded, open the app. It will show you a screen with a web IP address on it. Leave the app open and then enter the address it provides into the web browser (Chrome, IE, Safari, etc.) on your computer. A window will pop open on the computer showing your iPad and the different folders you have created on it to store your photos and videos. If you are looking to upload media from your computer to the iPad it can be done from the first window you see. 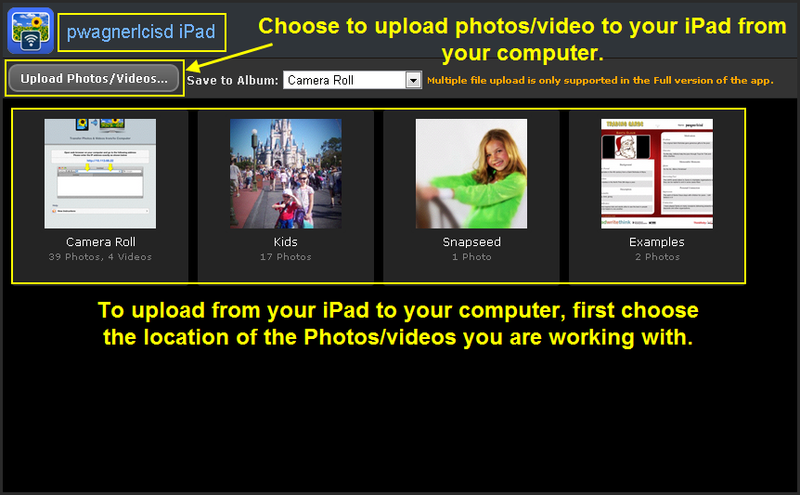 Choose the location you want the file to save on the iPad and then browse to the file you wish to upload. Note that the free version of the app only allows you to transfer 1 file at a time to the iPad. If you are looking to transfer files from your iPad to your computer, select the folder where the files you are transferring are located. The screen will refresh, opening the folder you have chosen. You can now select the photos or videos you want to transfer. You also have a “select all” option. Note that the free version of this app allows you to transfer up to 50 files at a time to your computer. If you select more than one file to upload, a zip file will be created and sent to the computer. Open the folder on your computer to view all the files you have transferred. There is a paid version of this app that will allow you to transfer more than 50 files at a time from device to computer and also allow you to upload multiple files at once from computer to device. The paid version is $1.99. Try the free version first to be sure your network is not blocking the use of this app. If it works and you find you need more freedom with the app, purchase the paid version. Then sit back and enjoy Simple Transfer! So, it seems Simple Transfer is working well for you huh? I love it. One thing I might note is that the while the free version only gives you the ability to transfer 50 files, it’s the first 50 of each album…so if the photo or vid you want to transfer is #51 in the album, you can’t select it. An easy work around that takes less time than deleting any of the files you might not want or need in that album (thus bringing it to within the first 50) is to just add that picture to a new album. Happy transferring!